I have discovered a new perfume brand I’m putting on my Christmas wish list: Floraïku. 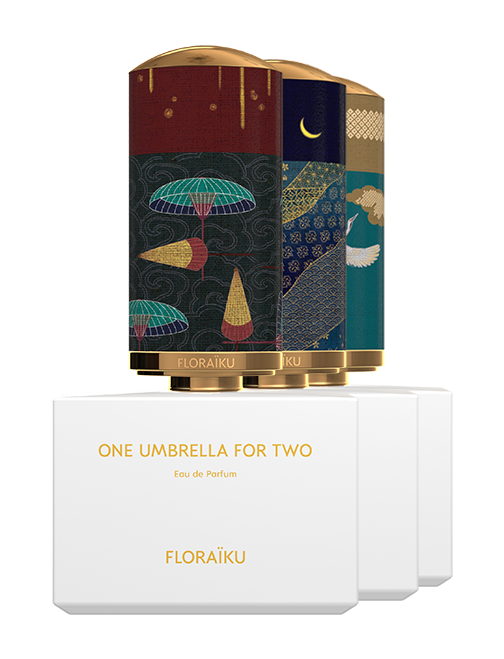 The perfume brand is created by John and Clara Molloy and is inspired by Japan. The packaging and concept is so beautiful and unique! All the bottles have a top part in a Japanese print that you can take off and serves as a sleeve for the hand-purse spray bottle that is also included in the ‘Bento box’. The fragrances are distinct and lovely. There are four ‘ceremonies’ ranges: ‘Secret Teas and Spices’, ‘Enigmatic Flowers’, ‘Forbidden Incense’ and ‘Shadowing’. Each ceremony consists of three different perfumes and can be recognized by the colour of the bottles – blue, white, black or red. The perfumes in the blue bottles, the ‘Enigmatic Flowers’ are all exclusively floral perfumes and can also be combined to complement each other. This range is inspired on the Ikebana-ceremony, the Japanese art of arranging flowers. The Secret Teas and Spices collection of 3 perfumes was inspired by the Ô Cha-ceremony, the Japanese matcha tea ceremony. This collection comes in a white bottle. Each perfume in this range is a blend of different teas with spices. They are fruity and nutty with a hint of spice. The black bottles from the ‘Forbidden Incense’ range are based on Japanese incense burning ceremonies and have a wooden undertone combined with sweet oils like for example patchouli. The red bottles from the ‘Shadowing’ collection are based on citrus tones. Besides the perfumes there are also scented candles and home diffusers. I love the design of the home diffuser!